There is no place to take shelter but yourself. Let us be poised, and wise, and our own, today. Patricia McDonough, a professional photographer with a fisheye lens, made this picture from her apartment’s living room within minutes of the first airliner’s impact. It was a perfect late-summer day in New York, the sort of day when a person feels terribly lucky to be in the city. A man named Pavel Hlava was showing his brother Josef around town and raised his video camera toward the World Trade Center just in time to catch a bright object flashing in the sky and then a puff of smoke from the north face of the north tower. A French filmmaker, Jules Naudet, who was making a documentary about firefighters, was with a fire truck responding to a gas leak at Lispenard and Church Streets downtown when he heard the roar of a jet engine and raised his camera to catch the plane too. And so did two Webcams from an apartment window in Brooklyn. It was 8:46 a.m. on the 11th of September, 2001. At 8:49 a.m., CNN went live with a shot of the towers from a camera on the West Side. The second plane hit the south tower at 9:03, and by that time dozens of cameras were on the scene, aiming upward. In his apartment at Broadway and Franklin Street, Lyle Owerko heard the first explosion, grabbed a Canon EOS 3 with a 400-millimeter zoom lens, dashed downstairs and around the corner to Chambers Street. “Life was still oddly normal,” he tells David Friend. “People stood buying bagels and coffee [from] corner street vendors.” Tom Flynn, a CBS News producer, was reading the morning paper on his deck in the West Village when “a plane went over the trees in my garden. It was low, it was loud, and it was determined. It was not right. It seemed to be revving up. Then there was a pop, like the sound of a softball hitting a glove.” He said to his wife, “We’re under attack,” and jumped on his bike and headed downtown. At the trade center, he found a Merrill Lynch employee, Eddie Remy, shooting video, and signed him up for CBS. By the time the south tower collapsed, shortly before 10 a.m., there were hundreds of photographers on the scene, some on assignment, some freelancers, most of them amateurs. Grant Peterson, shooting for Brides magazine in his studio near Broome Street and Broadway, turned his 4-by-5 view camera toward the burning towers. A woman named Kelly Price bought disposable cameras at a bodega and was taking pictures of the fires when the south tower pancaked to the ground. She raced down Broadway, running for her life, stopped at Pine Street and took a picture of the advancing Niagara of dust and debris and a man running ahead of it. He is holding a camera in his right hand and glancing over his left shoulder. Friend, who was director of photography at the old Life magazine, writes: “As the morning crept on, New Yorkers poured into the streets, many to help, many in flight, all of them aghast. Out, too, came their cameras. Men and women by the hundreds, then thousands — bystanders with point-and-shoots, TV news teams, photojournalists by the score — felt compelled to snap history, fiery and cruel against the blue. People photographed from windows and parapets and landings. They photographed as they fled: in cars, across bridges, up avenues blanketed in drifts of ash and dust. They even photographed the images on their television sets as they watched the world changing, right there on the screen.” And soon thereafter, rescue workers in dusty yellow slickers started showing up at the Time & Life Building in Midtown trying to sell pictures they had taken. A brief review can’t do justice to “Watching the World Change,” a lucid, thoughtful and wide-ranging book. In truth, Friend’s excellent writing conveys more of the truth of the day than photographs can. The picture of the three firemen raising an American flag over the ruins, which became an icon of 9/11, is not nearly so gripping as the story he tells of the exploitation of the picture, the feelings of the photographer, Thomas Franklin, and the stoical refusal of the three firemen to be lionized (though they did approve plans for a bronze statue of themselves, 18 feet tall on a 12-foot marble pedestal). when they have done little or nothing. I see no evidence that the US is safer today than before September 2001. I just could not resist coming in and reading the rest of the story. You never cease to amaze me, Richard. I have a file of your writings that date back over the past ten years or so. I can remember giving you the URL to this site NCN. I can remember your protests and all the reasons that you could not come here. But you did anyway. Changing times in here too. I remember those first days that I spent here. What fun they were for me pasting cartoons and animated graphics all over the place. Oh changing times indeed. I went down to visit Sindy. Anyone remember Sindy? Well she has a beautiful piece of poety framed and hanging on her bedroom wall. She told me it was written by a dear friend and a Master Channel. I smiled when I recognized the name of a woman in here that I once had some good times with. Oh changing times there too. And then the waves of sadness wash over me. Yet I find a moment to smile. For many memories are very good and worth keeping. I think it might just be so with 9-11 too. Some things are worth keeping. Some are sad, but still worth keeping. Love to you Richard, for sticking it out. film on Jules Naudet's filming of 9/11 (two hours long) was shown here (UK) on Saturday in memorium. He and his brother were hired just to film routine firefighter work at this one fire station. Jules said it was a miracle, he was there and saved from being buried with the fire crew he was with on the first callout alert to the Towers. They did not know what had caused the diaster for some time, until back in the station regrouping, before returning continuously to the carnage scene. Jules also went with the crew to the wreckage, and whilst the crew wore protective safety gear and correct footwear, Jules and his brother were in normal clothes, they had just forgotten about the dangers and were caught up in their own task of filming as the crew of digging and rescueing. The other miracle was that not one fireman was lost from this station, they could not believe it either, together with the drama of the whole event. Another fire man said they could not believe that not one piece of whole furniture or computer was found, nor a whole person. The largest piece of "stuff" he found was the key pad of a telephone. Everything else he said had been blown to dust. 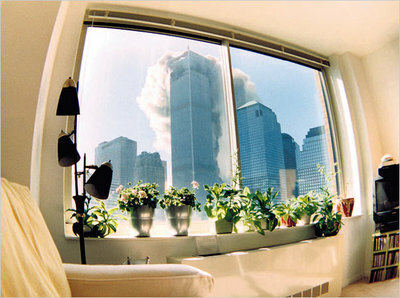 On that morning, after the first hit we gathered in my boss's office to watch the news, to see the second plane hit. It was too much to take in there was silence, no one spoke, for myself there was a conscious effort to take breath. On my first visit to America, in '98 I really loved the country and liked the people. There is no doubt life there has barriers lifted to the skilled. In a way it was like going back in time, not fowards. The historicisity in the buildings juxtaposed to the modern inserted a grid road system was complete dichotomy. Experiencing the old in a modern way and the modern in an old way! just by crossing the road. On my first day in LA my eyes opened to a most beautiful golden sunrise through the forest of palm trees Venice way, more than ever could be expected. However, it was Philadephia that took my heart after climbing up inside the tallest brick tower in the world in the City Hall and visiting Independence Hall. Every place visited was simply wonderful, as was the 18th century house by the Delaware river: it's ships' horns and life of the river coming in through the bedroom window. The church we attended as a family was barely removed from the 17th Century times in atmosphere, an atmosphere as pristine and pure as it must have been then when family values were the only knowledge. On leaving tears came to the eyes. It must be precisely that American absorbs foreign cultures into its own that it is unable to comprehend or respect the cultures of outside countries. This faculty is simply a stranger to its fundamental make up. One without the other would be impossible. My personal experience of America can only be reached through the memories and my own visit. Whilst engaging in anything else American in any media, the experience is reduced to commonplace. It is very rare to rediscover My America through the work or experience of others. There is no vicarious aspect here, apart from the film of the most famous architect Louis Kahn, made by his son, called "My architect", through which I sobbed copiously. Whereas, simply by speaking French, picking up a french magazine, looking at pictures of anywhere in France, on anything, emailing our Ming here, each and everyone transposes the self instantly into a Francouniverse, it can be and is totally vicarious. But not with America. Very strange. This is why, I believe I mentioned elsewhere, that America is definitely geared towards the Self, or some form or stage of the condition. This argument here is quite obscure, but I hope it is a piece added to the greater picture of everyone's dilemma with this country. For Jazzolog. I've seen both films Nicola cites...and own them in fact. I'd like to mention Oliver Stone's depiction of the fall of the World Trade Center, currently showing in theaters. In fact, after the towers fall (in a shattering staging) is when the real drama of the film begins. The sense of time in the movie makes it very different from other presentations of the tragedy. by Stone. I presume you're talking about, Richard, the propaganda film starring (TaDa!) Nicholas Cage? BTW were the explosions inside the building, not connected to the supposed AIrplanes or their 'jet' fuel, ever mentioned by Mr. Stone? Too stoned to follow anything other than 'the ''party'' line' was he? is often part of Vaxen's charm. There is much critical fuss about Oliver Stone's ignoring of many aspects of 9/11. People were expecting another JFK, but he went somewhere else with it---and that somewhere is being attacked too, saying he just wanted to appeal to the Right Wing. People can do that all they want, but nevertheless I think what we have is a very good movie. Mr. Cage plays the whole film buried up to and including most of his head. As for the various theories about 9/11, I want to assure Vax I am very much au courant---and even wrote a piece about those concerns here~~~ http://www.newciv.org/nl/newslog.php/_v63/__show_article/_a000063-000372.htm . If my kid ends up speaking Arabic that'll be fine. and the New York Review of Books gave it a fairly bad review. But what do we expect from a movie? Entertainment. Movies are incapable of presenting any truth whatsoever. They can move, they can rouse, they can tickle, and they can surely entertain. But paradoxilly (did I spell that right?) they are the least capable among all mediums of presenting any truths. Even relying upon the literal nature of a camera. Which in its objectivity falls flat when offering any true record. Movies should not ever be taken seriously. They are incapable of bringing any reality or genuine truth into our homes. Enjoy them, that's all. "Casablanca" - now there's a movie! One which still moves me. Are those of you who live outside the United States familiar with this magnificent film? loudly in truth! of course more than mere words. The problem with just words is that one cannot force everyone to make the identical assumption or reading from those words - this precisely what we are all dead against isn't it? It's got a name, can't remember ....f something? The beautiful restaurant, with waiters (artists) and guitar players trained by students of Segovia, with french food and hand made furniture, floors, paintings, everything, no electirc light, which I had with my first husband, was modelled on the restaurant in CASABLANCA. Visited by the writers, filmakers, artists, spies, shopkeepers, bankers, stockbrokers, mining magnates, penniless artists driving white Rolls Royces, Surrealist friends and fashion models. It was to awarded a prestigious Micheln star, but we decided to sell - oh for the flowers of youth! The building still stands opposite the quayside in Penzance harbour where the ships from the Scilly isles dock every day. Small interlude here, sorry, illustrating the broadness of effect of this aspect of America! Film making. The next surely, is "An Inconvenient Truth" by Al Gore. I'm a little surprised by Quinty's assertion that no "truth" of any kind is ever presented in cinema. My god, what HAVEN'T I learned from the movies! Last night I watched Andy Garcia's very personal epic about Havana during the last days of Battista and the first of Fidel, called Lost City. Not a great film, in my opinion, but the music and dance was fantastic! There was truth there. Over the weekend I caught up with Ingmar Bergman's Saraband, and Liv Ullman helping a kind of stepgranddaughter get out of a stifling family situation. As usual I felt Bergman's touch deeply and personally---and there's a fine documentary on the DVD showing the master at work. For the heck of it over the holiday I watched Kiss Kiss Bang Bang, with Downey Jr. and Val Kilmer. Absolute fluff but great fun. No truth? One might as well posit no truth ever can come from sitting at a little streetside table outside a friendly bistro. it's a paradox. A photograph, in all its literal objectivity, is incapable of expressing the truth of the object it captures. Look a little deeper and perhaps you will see that. But then I had better defend what I just said. In portrait photography, for example, excluding all the vulgar contrivances and posing for effect, the image which is caught more often than not expresses the photogropher's personality. This is true of all art. (In my opinion photography is a very inferior art - I know, that would be considered blasphemy by some, but most of the work is performed by a machine. And its personality leaves comparitively little for the photographer's.) And the resultant photographic image of that person doesn't truly capture him or her. This is true of all film. It can be entertaining, it can take you to another world: for inherently film is incapable of capturing the truth because it is so literal. Have you ever seen a film, let's say, of San Francisco. There's all the beauty, the cable cars, the incredible vistas of the Bay from the hills. You may actually feel as if you have been there because the film was so well made. But once you go, actually taste the air, it will be totally different. If will have a quality the film never cought. There will inevitably be a great deal it missed. It's not for nothing that some film makers are known as "auteurs." And their personalities shape the finished product. Yes: it's a paradox, the imagination, when let loose, allowed to fly by a great poet or artist, will capture the essence, or soul, or reality of the moment, far more accurately than any photograph. In a way which is truer, far deeper and meaningful. Look at an Ansel Adams. It looks like an Ansel Adams. Mathew Brady's photographs of Lincoln, as fascinating as they ae, as promising, offering the hope to find something deep in that great man's face, offer a stiff Lincoln adjusting for his portrait. The shot is literal, and true as far as it goes. The lines in the face were there. But it's not Lincoln, not the one the people around him knew. Yet, we are grateful, aren't we, to have it. This record of what Lincoln "actually" looked like. And those old photographs are fascinating. But this record is only a split second in his life: and doesn't offer what it felt like in the air being with him. His wit, the way he made the atoms dance surrounding him as he talked. That Walt Whitman could do. And it's far truer. What do you get when you read Whitman? You get Whitman: that unique and extremely powerful voice. And a description of Lincoln coming from Whitman is probably more Whitman than Lincoln. We expect that. The paradox, though, which I have been aluding to, is that a photograph offers a literal presentation. It's in the packaging. "It's a photograph," we say. "It has to be true." My argument is that in that frozen second in time the image we get is a distortion. The object's image becomes simultaneously twisted and fixed. We've all known that in photographs of oursevles and of others. Some people, we say, are photogenic. That the camera is kind to them. Others, well, we know that something is lost when we look at photographs of them. In a painting, a portrait, however, we don't expect that same literal binding with truth. We expect art. And an artist, a good artist, is far more capable of capturing the appearance of a person than any camera. For by being literal the camera lies. The photo reflects the light, mood, pose, and dress which was selected for the occasion. Yet the camera promises the literal truth. It may, under the influence of the photographer, reflect, instead, everything that went into making that photo. And though literal it may not at all be true. 7 Sep 2006 @ 08:00 by jazzolog : Ready For Bush's Big9/11 TV Spectacular? "A friend of mine [Cyrus Nowrasteh] out in California has produced and filmed — I think it’s a two-part mini-series on 9/11 that ABC is going to run in prime-time over two nights, close to or on 9/11. It’s sort of surprising that ABC’s picked it up, to me. I’ve had a lot of people tell me about it, my friends told me about it…And from what I have been told, the film really zeros in on the shortcomings of the Clinton administration in doing anything about militant Islamofascism or terrorism during its administration. It cites failures of Bill Clinton and Madeleine Albright and Sandy Burglar." On September 10th and 11th, ABC -- which is owned by Disney -- is planning to air a "docu-drama" called "Path to 9/11," which is being billed as "an objective telling of the events of 9/11." In fact, the film was written by an unabashed conservative http://thinkprogress.org/2006/09/01/nowrasteh-conservative-activist/ who twists the facts http://www.firedoglake.com/2006/09/04/hijacking-911/ to blame President Clinton http://thinkprogress.org/2006/09/01/abc-blame-clinton/ . In fact, the list of counterterrorism initiatives http://www.truthout.org/docs_2006/083006J.shtml undertaken by the Clinton administration is lengthy and comprehensive. Regrettably, the record shows that most of these efforts were watered down or abandoned by the Bush administration when they came into office. History will also record that President Bush was the one who received -- and while on vacation, chose to ignore -- a Presidential Daily Briefing on August 6, 2001 entitled "Bin Laden Determined to Strike in US." ABC's new six-hour film was apparently screened in advance only to conservative bloggers and journalists -- and received extensive praise from none other than Rush Limbaugh. ABC is advertising the film as being "based on the 9/11 Commission report" -- yet also admits that it's a "docu-drama," in which writers and producers are free to invent and distort facts. Former counterterrorism czar Richard Clarke has already completely refuted http://thinkprogress.org/2006/09/05/clarke-blasts-abc/ one of the key scenes of the movie. It's simply stunning to think that as this fall's election approaches, a major television network would devote six hours of prime-time programming to air such a slanted and inaccurate program. There is simply no way that a conservative writer, with an anti-Clinton axe to grind, should be allowed to use public airwaves to broadcast a gross distortion of the truth -- especially on the anniversary of the worst day in our history. "the list of counterterrorism initiatives undertaken by the Clinton administration is lengthy and comprehensive. Regrettably, the record shows that most of these efforts were watered down or abandoned by the Bush administration when they came into office." Regrettably, the record will always be incomplete, due to "Sandy Burglur" Sneaking out some key documents in his pants. To bad he was never held to account for that. Incidently, Rush is supposed to appear tonight on the "Perky Katie Couric" show tonight, for a whole one and a half minutes. I gave up on teevee years ago, so I'll miss it, but I wonder if you will have the intestinal fortitude to endure 90 seconds of excellence in broadcasting. Hey, you may get some ammunition from it. 7 Sep 2006 @ 17:56 by vaxen : Worst day? It is folly to argue against determined hardness; eloquence may strike the ear, and the language of sorrow draw forth the tear of compassion, but nothing can reach the heart that is steeled with prejudice. An army of principles will penetrate where an army of soldiers cannot; it will succeed where diplomatic management would fail: it is neither the Rhine, the Channel, nor the ocean that can arrest its progress: it will march on the horizon of the world, and it will conquer. Memory, like a beauty that is always present to hear itself flattered, is flattered by everyone. But the absent and silent goddess, Forgetfulness, has no votaries, and is never thought of; yet we owe her much. She is the goddess of ease, though not of pleasure. How impious is the title of sacred majesty applied to a worm, who in the midst of his splendor is crumbling into dust! When republican virtues fail, slavery ensues. of vital importance to the commander and for the conduct of his mission. information about the meteorological conditions of the terrain. http://www.popularmechanics.com/science/defense/1227842.html and several web pages following. would be a good time to stop bickering and remember that we are all Americans, and therefore all targeted by a resolute army of fanatical warriors. The enemy does not care if we are Republican or Democrat, liberal or conservative, believer or athiest. It just wants us defeated. If you're in the mood listen to Larry Bensky yesterday discuss these matters. A very interesting conversation, with good guests. Just click on the Listen icon. During the first he talks about conspiracy theories. 11 Sep 2006 @ 14:41 by vaxen : Fanatical warriors? According to a poll by Ohio University and Scripps Howard News Service, 36 percent of Americans believe that government officials "either assisted in the 9/ 11 attacks or took no action to stop the attacks." Sixteen percent of Americans, the survey indicates, believe that "secret explosives"...brought down the World Trade Center towers. Robert Bowman, who directed the "Star Wars" defense program under Presidents Gerald Ford and Jimmy Carter, reached his own conclusion after questioning...why the American military hadn't intercepted the hijacked planes before they hit the Pentagon and the World Trade Center [and] why the Pentagon didn't release surveillance tapes of American Airlines Flight 77 hitting the military complex. A former U.S. Air Force lieutenant colonel with a doctorate from the California Institute of Technology...Bowman theorizes that Cheney and other officials stood to benefit financially. Bowman says they had a long-standing desire to control Iraq's oil and to use the country as a strategic hub for controlling the entire Middle East. The Sept. 11 commission, he says, neglected to investigate these possible connections, leaving a huge gap in the official account. Scholars for 9/11 Truth [is] an organization that believes the U.S. government "permitted 9/11 to occur." Among the group's members are Paul W. Rea, a humanities lecturer at St. Mary's College in Moraga; Tracy Belvins, a research scientist in bioengineering at Rice University; Kevin Barrett, a lecturer at the University of Wisconsin-Madison...and Stephen LeRoy, an economics professor at UC Santa Barbara who has been a visiting economist at the Federal Reserve Bank of San Francisco. One friend here in town referred me to Juan Cole's post yesterday about all the varieties of jihad groups around the world. http://www.juancole.com/2006/09/war-with-al-qaeda-war-with-al-qaeda.html#comments So, is what unifies them worth bothering about? It's a little like paying attention to the groups here that don't want to pay any taxes. Their politics and spirituality is all over the place...but does any of it come down to a realistic appraisal of how society works? Fundamentalists everywhere seem nuts to me, and I believe they need assertive confrontation toe-to-toe. Ignoring them, as Vax' posts reveal, has not been good policy. I start where I am, and that's in the schools where I work everyday. It's not easy, because you know there's this ethic of just letting the other guy believe whatever it is he does. The problem has become he won't let me believe what I do, and is developing the clout to enforce that. All the Mr. NiceGuy in the world doesn't work if you believe it's OK to allow a pregnant girl to terminate an embryo because the intention for the creation of that "life" was nonexistent or just plain wrong. What intention do fundamentalists have for the world anyway? The main problem with ''all'' book religions is that they try to contain and capsulate life... never happen. Life will always break through the containers with which small minded men and women everywhere try to contain it. Fundamental means fundamental and that can apply to all the ranges of belief ''systems'' invented by humans over the long history of our advent on this planet. I would say that the intention of fundamentalists of any ilk is containment for the purpose of... control and exploitation. Al Qaeda is only one group. There have been several over the decades in the Middle East, all angry about something. And frequently having a genuine basis for their anger. I think we should admit that, unless we desire to see the world in terms of black and white, good and evil, us v. them. This only leads to punching out blindly into the dark, as we have finally begun to discover here in the US. After all, how would you feel if some uppity foreigner came into your neighborhood with his tanks and dicta on how you should behave, rearranging the local lawn chairs to his own liking? Choosing your leaders, denigrating your habits and customs, redefining your borders and property lines, telling you constantly, in numerous overt and subtle ways, that you are quite inferior? Or, like Paul Bremer, simply opening up all your resources, belongings, home, infrastructure, whatever is unchained to the floor, to any fat cat investor who wishes to move in, exploiting whatever treasure he can find in your neighborhood, while simultaneously playing some huge political game? We seem to tenaciously cling, here in the United States, to the fiction that all the anger is an irrational, fundamentalist lunacy. "The clash between civilizations." When you have that many people (about 1.3 billion Muslims?) there is indeed a great variety of opinion. That's only human nature. But let's at least have the decency to ask ourselves in this country: do we really know anything about these people? Must we always assume that because we are we and they are they that they are inferior? That these billion plus Muslims represent some black Islamist tide? Toss your line into the sea: if it brings up a bass does it mean all the fish in the sea are bass? Once again let me ask: who is occupying whom? Who has an army where? Who choses leaders and defines foreign boundaries? Who exploits whose resources? Who changes governments, even freely elected governments? And who turns against whom - even a democracy - when it suits them? Lebanon being the most recent democratic example. I'm reading an interesting book on the history of Israel and its relations with the Arabic world: The Iron Wall, by Avi Shlaim: a professor of international relations at Oxford. The picture which emerges from this book is one of complete madness: war as an expression of self, having no meaning, or any genuine end, except, perhaps, to beat one's head more violently against a wall: to get ones way. How can this, as a moral portrait of human behavior, be denied? Since war is a crime and an expression of sickness, a deep human sickness, to begin with? A pitfall we humanity seem to constantly, willingly, drop into? Many, many years ago I showed up at an empty theater in New York to join an activist group which would go down south to fight Jim Crow. When I arrived at the theater two or three white boys were up on the stage in charge. The women were required to provide the coffee and donuts. And no ignorant black guy was going to tell these white boys what to do. Or were they - the leaders - at all interested in the ideas of some young new white recruit. He too could get coffee and donuts so far as they were concerned. Though I was never presumptuous enough to ask them any questions. It was apparent they knew best, so I didn't stay around all that long. After all, that some eastern white guys understood segregation better than the blacks was a gross apparent folly even to me. If only we had a competent, sane, and intelligent government today in the United States so much would be so different. Bush, Olmert, Blaire - they deserve each other. But do we deserve them? Are we merely lemmings, running off the edge of the cliff? I know we are more than that. But this same drama seems to play itself over and over again, decade after decade, century following century. "Governments" are composed of individuals. To discover the extent to which some concepts are bogus, it may be necessary to dig into history (particularly revisionist history). For example, in the case of the so-called "US Constitution" we find that the 70 odd people who signed it as "We the people of the United States of America" signed it on their own behalf and made no attempt or even suggestion that it would apply to any descendants of people then living. The people who pretend to "govern" in the name of the so-called "US Constitution" are liars and impostors. The people who kill in the name of the so-called "US Constitution" are terrorists and murderers. The people who tax in the name of the so-called "US Constitution" are thieves and robbers. Similar considerations apply to other political systems around the world. The concepts and words we use have consequences. Concepts can be "locks" that lock us into automatic unworkable thinking and behavior. Most humans cannot question their concepts. Some advanced humans can and do. The consequences of fraud-concepts, such as "country," "constitution," "government," "law," "nation," etc., include war, poverty, crime, pollution, and a host of other apparently intractable problems. Most humans cannot see this. So their "solution" is to "change the government," or to advocate "new laws," or to "smash the state." They remain stuck in the same old conceptual framework that is at the root of the problems. The results they have produced so far have been meager, to say the least. It remains to be seen whether a sufficient number of humans can break through the conceptual frameworks of current primitive human culture, in order to create new civilizations completely outside our current abominations. "... [T]he political confidence trick, whether monarchic or presidential, oligarchic or democratic, whether necessary or unnecessary, is at any rate effective, because most people are foolish and gullible." "Is political history the record of a mass of mugs being taken for a series of rides?" "We see the politician rather as an actor who takes on a part; and we judge him according to whether he plays well or badly." "The theory is comforting: they are our hired servants. The practice is humiliating; we are their wayward wards, to be comforted, cajoled, bullied, but never to be treated as equals, never to be told more of the truth than suits their present purposes, and too often to be told off-white lies." "He [Churchill] is, as all political actors must be, the analyst of humbug, the humbugger and the humbugged all in one." in this country of late is never to negotiate or debate with one's opponent. Guys running for the same office footsie around like playground boys over who is going to challenge who...so the other one can ignore the invitation. What is this freedom and democracy we assert we are bringing to people except open discourse into disagreement? Bush allows no people---even reporters sometimes---into his speeches if there is any possibility of a disagreeable question. What IS this? We are the same with other countries...and even worse. We label an opponent "terrorist" and then we don't have to talk to him, can murder him on sight, or shut him in a dungeon forever without trial. It's obscene. Thanks Paul and Vax for your comments. It's an honor to read what you guys write here. 13 Sep 2006 @ 20:02 by Quinty @68.226.88.25 : YES! We have to speak to our enemies! Christ that "my way or the highway" business is dumb. I wonder how all these PNAC types feel now that with our full might we smashed our fist into Iraq and the Iraqis are shaking us around? That wasn't supposed to happen. Not to the "world"s only remaining super power." Remember, we were going to be "the new Rome." "The events of September 11 were certainly unique as the most concentrated, most dramatic, most deadly acts of terrorism we have known. Yet I would not say they “changed the course of history”, because I see them on a continuum of terrorist acts with common characteristics. What they have in common is not sadistic madness, but perceived grievances. The grievances are held by huge numbers of people, and a small number of those will carry their anger to the point of terrorism. It would be a dangerous mistake to ignore those grievances. Indeed, we have already put ourselves in greater danger by doing that. With the Irish Republican Army the grievance was the British occupation. With the Palestinians, it is the Israeli occupation. With Al Qaeda it is the American military presence in the Middle East, as well as the support of Israel. The common denominator for terrorism is not, as has been said, the religious fundamentalism of Islam, but fairly obvious political issues. The Princeton scholar Robert Pape, in his book Dying to Win, studied 188 terrorist attacks around the globe, from 1980 to 2001, and concluded that their common roots were not religious fanaticism, but political grievances centered on foreign occupation. To see September 11 as unique removes the possibility of putting it in historical and world context, and understanding its roots, which lie in the imperial expansionism of the United States. If we are looking for uniqueness, we might find it in the fact that while countless people in other countries have suffered the consequences of a violent US foreign policy, for the first time American civilians became the victims, most obviously of Mideastern fanatics, more fundamentally of America’s imperial ambitions." "I am in between stories. The old one is gone, and the new one is just beginning to take shape. When we already have a story we are heavily identified with, whether we appear to like this story or not, it is difficult to stay awake, to watch our thoughts and feelings without letting them dictate our actions. A clear story about who we are makes it hard to wait and let our actions arise from the deep and open emptiness of experiencing who we are right now, makes it difficult to allow actions to arise that may be inconsistent with how our story says we should move." Nine/eleven 5 has come and gone, and most Americans are doing what we seem to do best: pack it up, put it (whatever "it" is) behind us & move on 'til next year. I probably would be too, except that my situation at work is changing critically and radically. At my age (pushing 67---ooomph) the most radical thing I would like to be doing is sitting home in retirement, catching up on Dickens and Dostoevsky I haven't read yet. But times have changed...and politicians and billionaires have changed them...and retirement is a very risky business for the average Joe, so I stay on the job---trying to still look young enough to be there. Currently I can't just hide out somewhere, and I'm facing harder work than almost anytime in my life...but that's another story, and kinda personal. The point is I didn't get around to following some links about 9/11 from some friends until this morning...and their powerful importance compels me to share. I read over Hitchens' article and am unconvinced of his key points. http://www.opinionjournal.com/editorial/feature.html?id=110008926 He seems to believe that there is a unified international terrorist force under the influence of bin Laden. Robert A. Pape may have the best data-base on suicide bombers. He argues that the groups that have employed them are not unified and often are engaged in "local" struggles against their own states. Some of them are secular like the Tamil Tigers in Sri Lanka, which are responsible for 76 of the 315 suicide attacks from 1980 to 2001, or the Kurdish PPK's use against Turkey in their quest of an autonomous state of their own. With respect to Al Qaeda, you might take a look at James Fallow's article in the current issue of the Atlantic on how much the organizational capacity of Al Qaeda has already been diminished. Fallow's sources also suggest that the overwhelming part of the "resistance" in Iraq is home-grown, and has nothing to do with al Qaeda. So I wonder whether "our first duty," as Hitchens says, is to create "solidarity" with "bin Laden's victims and targets." Pape finds that groups that employ suicide bombers along with other "terrorist" tactics often gain their inspiration and commitment from the foreign occupation of their countries. He writes, on page 247 of his book, "our objective should be to withdraw all American combat forces from the region expeditiously, while working with Iraq, Saudi Arabia, and other Persian Gulf States to ensure that they maintain the critical infrastructure for a rapid return of US forces should they prove necessary." I am reminded of how US policy has been instrumental, indeed fundamental, to the creation and growth of al Qaeda. On this point, I would refer you to Robert Dreyfuss' book, Devil's Game: How the US Helped Unleash Fundamentalist Islam. From reading Juan Cole's blog most days, I fear that the sectarian violence and factionalism in Iraq has taken on its own momentum and that, contrary to Pape, it will continue whether the US occupation continues or not. But, nonetheless, I think Hitchens' reference to "solidarity" against an international bin Laden movement is overstated, diversionary, and likely to produce the same counter-productive results as our policies have already generated. Hitchens also argues that we and our allies must become more ruthless in our battles against the terrorists. This strikes me as outrageous. Has Israel's assault on Southern Lebanon made Israel more secure? Has it reduced the stature of Hezbollah? How could we have been more ruthless against Iraq, after years of sanctions, the destruction of much of the country's infrastructure, schools, and hospitals, the hundreds of thousands of deaths and causalities wrought by our air war and occupation, and the environmental devastation (including cluster bombs and depleted uranium shells) that will wreak its insidious harm for generations to come? How ruthless would Hitchens become? Would he support Bush's inclination to use nuclear weapons against Iran, a country whose population is far less sectarian than that or our "friend' Saudi Arabia. Just one other point. I think that the enormous resources that we are expending in Iraq could be better spent on a massive program in support of renewable energy and conservation. Rather than becoming more ruthless in our foreign policy, we should become a leader in energy policy and take diplomatic efforts more seriously than we have. Ruthless is ultimately toothless. Tuesday he recommended a superb 9/11 article by Robert L. Borosage, entitled "Repealing The Bush Doctrine." Here's an actual strategy mapped out, something Bush opponents often are lacking. This article at TomPaine.com really is terrific, and take a look at that Apollo Alliance website he talks about! Thanks again for all that, Bob. While you're there, send TruthOut a little money too...if you have any. Thanks for your time! I think the US should apologize to the world. Confess our errors and demonstrate we have regained our sanity. I think this is very important. We need to prove, too, that we are willing to cooperate with other nations, rather than bully them. That we truly renounce empire. Show we are more than a corporate oligarchy. The rightwing offers a simple choice which, in truth, is no choice at all. We either lapse into "isolationism," they tell us, or remain fully militarily engaged in the Middle East. Stepping back from empire though is not isolationistic. Nor an expression of indecision and weakness. The Bush administration - with its unending lies - has conditioned many Americans into believing force is the only option. War (the clash of civilizations) the only solution. Nonsense. There is another way besides violence. Nor is it weak and wishy washy, as the right argues. with the now famous copy of "My Pet Goat" looked more to me like the look I get from my dog who just left a pile in the corner of my living room and is hoping I won't notice. Its funny because there is this whole other communication going on and its hard to ignor.